Hotel Tuxpan is one of Varadero´s classic hotels that have been on the preferred vacation list for many years. 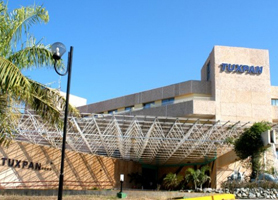 Way before Varadero became the iconic destination it is now, he Hotel Tuxpan, originally managed by an Italian travel company through the 90´s, has now returned to 100% Cuban management under the Cubanacan brand. Due to its age, the staff runs the resort extremely well, some having been there for over 3 decades and, this itself, shows through in the attentiveness to guests. Entirely remodeled some years ago, the hotel boasts; mini club facilities, games areas, Buffet Restaurants and “ A la Carte” restaurants, Lobby Bar, Beach Bar, Pool Bar, Piano Bar, Bar, Snack bar with snack service 24 hours a day, Grill, Daily and nightly entertainment activities, live shows. Other services available include; Massage service, Minibar, Shops, bicycle rental, laundry services, Currency exchange, Special dinner menus and selected international wine cellar and onsite doctor service. The Hotel Tuxpan in Varadero is especially good for families with children as it offers some of the best entertainment services in the whole of Varadero. These include usually “extra cost” kids lessons in sailing, surfing, canoes, pedal boats, catamarans apart from the habitual poolside games of darts, table tennis and pool activities. Due to its central location, just at the end of the Varadero strip, Hotel Tuxpan offers excellent walking access to the town and is just 100M from the famous Josone Park, kids amusement arcades and, the handcraft markets of Varadero. 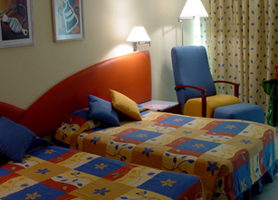 The rooms are very well appointed with excellent views of the luscious and well matured gardens of resort. The higher floor rooms offering amazing sea views and panoramic views of Varadero. As an all inclusive resort, the rates are extremely reasonable despite this not being visible in the food or service provided. The buffet offers and amazing assortment of dishes including all types of meats, fish, poultry and even prawns. Special menus (payable) are available which offer exquisite lobster meals or high grade sirloin meats with internationally renowned wines also available for a little extra. Situated right on the beach the hotel boasts a privileged position due to it being one of the first hotels in Varadero and as such very close to the town center, unlike some of the newer hotels which have become quite remote as Varadero has expanded. The Hotel Tuxpan is a venerable old classic which receives 1000´s of return visitors each year due to its simple ambience and highly efficient staff. Our booking process is unique because it shows the best rate from all of these for Hotel Tuxpan in Varadero Cuba and the types of rooms available. 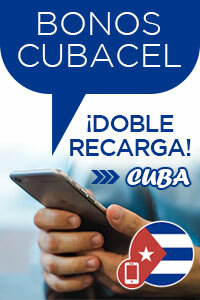 Our Hotel Tuxpan Varadero rate comparison is an industry first for Cuban Hotels. Once you’ve compared the rates, finalizing the booking at Hotel Tuxpan Varadero takes just seconds and an immediate confirmation is provided in real-time.